Whether you’ve spent ten minutes or five months working on a song, there’s a sense of satisfaction and relief that washes over you when you know, without a doubt, that it’s done. But… now what? Time to kick back and relax? Or, maybe you’re headed out to celebrate with friends. Not so fast! 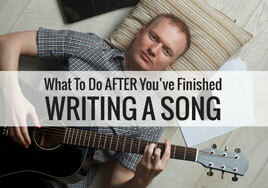 If you think your work is over when you’ve finished writing the song, you’re sorely mistaken. Finishing a song is a victory, but it’s not the final step in the process if you want your music to generate income for you. Here are six steps that you can take after finishing a song to help you transform your songwriting into a profitable business and position yourself for opportunities that may arise. Once your song is done, it’s a great idea to create an accurate, final lyric sheet. You should write out every word of the song exactly in the order it’s sung. Yes, this means avoiding shortcuts; no writing “repeat chorus.” Writing everything out reduces the chance of error, omission, or confusion and makes it easier for demo vocalists to accurately read the lyrics as they sing the song. How you format the lyric sheet can also make a difference for the vocalists. I’d recommend indenting your choruses to make them easily distinguishable from your verses and bridge. I’d also ensure that your lyric all fit on one page; you might have to single-space the lyric, combine shorter lines, or decrease the font size to do this (but not too small). If you still can’t fit your entire lyric on one page, you might seriously consider additional editing. Now that your song is done, you’re going to need a recording that captures its melody, lyric, and chord changes. As I’ve mentioned before, there is no Grammy for best rough recording; a simple guitar or piano and vocal recorded directly into your smartphone or laptop is perfectly acceptable. This recording is useful for a couple of reasons. First, it will prevent you from forgetting how your song goes. This may sound silly to those of you who’ve only written a few songs; but, as you begin to write more often and start to build your catalog, you’d be amazed at how quickly these little buggers can erase themselves from your memory. Second, if you choose to take your song to the next level, this recording will serve as reference for the demo vocalists and session musicians. Speaking of bringing your song to the next level: it’s time to decide if this song is currently worth a further investment of your time and financial resources. If we’re honest with ourselves as songwriters, we have to admit that not every song we write is worthy of a demo. However, if you believe that this particular song is genuinely ready, it’s time to record a demo. Since you’ll be presenting this to the music industry at large, the quality of your recording will reflect your talent and your dedication to your craft. This is not the time to hope that music business professionals will be able to “hear through” your rough recording. So, unless you’re prepared to spend the necessary time and effort learning to sing, play, and record your own songs at the highest level, I’d recommend using a professional recording studio, a trained demo singer, and at least one session musician. Yes, that means investing more money in your song, but—in this case—it’s probably best to leave the recording to the pros. You can spend your time writing more music. Whether you work with a studio or go the DIY route, I would be sure to obtain two high-resolution versions of your song: one with vocals, and one without. Instrumental versions of your songs are great to have, and this is the best time to get one! Ideally, the recording studio will have provided you with high-resolution files of your song. It’s important that you know how to embed necessary metadata (the song title, copyright details, contact info, and so on) and how to convert the high-resolution files (like .wav files) to lower-resolution files (like mp3s, which are easier to email). Both of these steps should be doable in iTunes or similar programs; instructions for your specific program can be found online. While these may seem like daunting tasks, they are important skills to learn. Think of them as preparing your product for shipment and including your return address. You’ll also need to store the files where they’re both safe and easily accessible. This way, when an opportunity presents itself, you’ll know exactly where to find them. I can’t think of anything more depressing than an artist, label, or publisher asking for a copy of your song, and you not being able to find it. Now that you’ve got your songs and all the accompanying information properly labeled and stored, it’s time to set up a reliable backup system. Learn how to back up your computer to a separate drive or cloud storage system. Remember, it’s not “if” your hard drive—with all your rough recordings, lyric sheets, and finished demos—fails, but “when”. My motto is: if it doesn’t exist in two places, it doesn’t exist. Under no circumstances should you go without some kind of backup. That’s simply a recipe for a catastrophic event. DON’T brush this off as an unnecessary step or a waste of your time, and don’t put it off until you have x number of songs finished. Make it a part of the process for each and every song. You made a significant investment to write and record those demos, and your songs themselves are irreplaceable; why wouldn’t you want to protect them? I know this sounds obvious, but once you have a finished demo of your song, you can’t expect if to make money if it just sits on your computer. You have to get your music in front of people! While I was a tiny bit guilty of this early in my career, it still amazes me how many songwriters make little to no effort to get their songs out there. They make a variety of excuses, too. “But I create music… I’m not a salesman!” To these musicians, selling music might as well be selling dirt. It lacks all the charm and creativity that they associate with being a musician. It might not be exciting, but it is essential if you want to make a career as a songwriter. As I said at the beginning of the article, completing a song is a victory. It’s a remarkable accomplishment! Don’t ever forget that, and don’t think I’m saying otherwise. I’m simply saying that, if you want a career as a songwriter, it’s not the last step… but the above six steps will help you get there. Cliff Goldmacher is a songwriter, producer, session musician, engineer, author and owner of recording studios in Nashville, TN and Sonoma, CA. Cliff’s site is full of resources for the aspiring songwriter including monthly online webinars. Cliff’s company, Nashville Studio Live, provides songwriters outside of Nashville with virtual access to Nashville’s best session musicians and singers for their songwriting demos. ©2014 NationWide Disc. All Rights Reserved. Excellent and concisely written advice. Thank you. Great article. The link at the bottom about avoiding common mistakes is a must read. Written with compassion and a true interest in helping others learn, and with clarity. Especially good is the information on including metadata and archiving. YouTube “metadata” and “ISRC” if you need to learn about this. Not complicated. I am not a muscian, so there is no melody, but I do have lyrics to a song I wrote. I’ve had people read it and really like it. How do I find someone to possibly bring in the melody for it? Premier source for affordable, industry-best duplicated and replicated discs and disc packages. Studio? Broker? Record Label? Maximize business presence and client relations with our affiliate program! The musician’s resource for industry creatives & experts in mastering, design, recording, distribution, and production. Save on disc package reorders. Quantities starting at 300. Retail-ready packages on a budget!